Food Not Bombs grew throughout the 1990s, and held four international gatherings: in San Francisco in 1992 and 1995, in Atlantain 1996, and in Philadelphia in 2005. The 1995 International Food Not Bombs Gathering took place in and around United Nations Plaza in San Francisco at the same time the world was celebrating the 50th anniversary of the founding of the United Nations (at a historic conference in San Francisco). Chapters of Food Not Bombs were involved in the rise of the Anti-Globalization Movement in the late 1990s, leading to the APEC resistance in Vancouver in 1997; the June 18, 1999, International Carnival Against Capitalism; and the so-called “Battle of Seattle” later that year, which shut down the World Trade Organization meetings. Food Not Bombs helped start the Low Watt FM Free Radio, the October 22nd No Police Brutality Day, and Homes Not Jails during the San Francisco days. 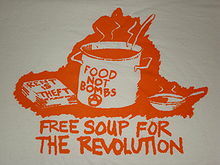 Food Not Bombs supported the actions against the by providing meals at protests all over the world. During a presentation to the University of Texas at Austin in 2006, an FBI counter-terrorism official labeled Food Not Bombs and Indymedia as having possible terrorist connections. Orlando enacted an ordinance prohibiting serving food to more than a certain number of people without a permit. In the fall of 2007, Eric Montanez of Orlando, Florida’s Food Not Bombs was charged with violating a city ordinance by feeding more people in a public park at one time than the law allows without a permit. On October 10, 2007, Montanez was acquitted by a jury. Food Not Bombs and a church for the homeless called First Vagabonds Church of God sued the city over the ordinance on the grounds that serving food is first amendment-protected political speech and religious activity. The groups won and the city ordinance was overturned; however Orlando appealed to the 11th U.S. Circuit Court of Appeals and won. On August 31, 2010, the 11th U.S. Circuit Court of Appeals threw out the decision, barring Orlando from enforcing the ordinance until another hearing before a 10-judge panel takes place. A Food Not Bombs chapter serves a meal in a public park. As of October 2011, there are more than 400 chapters of Food Not Bombs, with about half the chapters located outside the United States. Food Not Bombs has a loose structure: every chapter of Food Not Bombs embraces a few basic principles, and carries out the same sort of action, but every chapter is free to make its own decisions, based on the needs of its community. Likewise, every chapter of Food Not Bombs operates on consensus. Besides collecting and distributing food for free, many chapters of Food Not Bombs are involved in community anti-poverty, anti-war, and pro-immigrant organizing, as well as other political causes related to social justice.